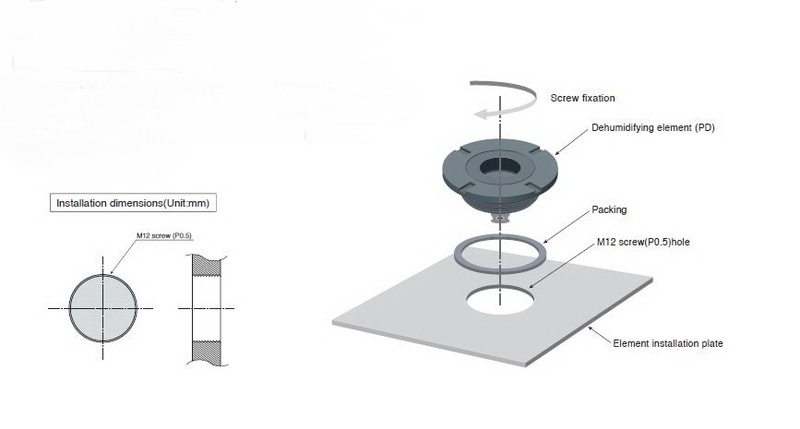 Make a clearance or screw hole for an M12 (P0.5) mm fine pitch screw in the container on which you will install the dehumidifying element. Position packing and slowly screw the dehumidifying element into place. Note the packing is not supplied. 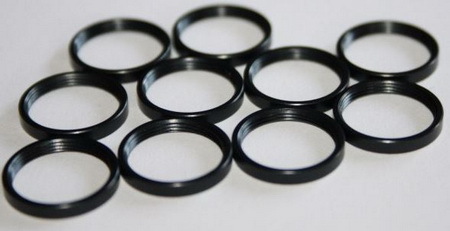 M12 Aluminuim locking rings for model PD dehumidifiers, Outside diameter 14mm, depth 2mm (Specified torque 0.18 N. m). Make a square hole 12.5 mm x 12.5 mm in the container, insert the packing (included) and attach the dehumidifying element with four M2 screws. RD3 is installed on the inside of the container, and RD4 on the outside. (Specified torque 0.18 N. m). The new range of optional Rosahl mounting kits for the MDL series of membranes is designed to simplify membrane installation. Fabricated from pre-drilled stainless steel, three models are available. They are MDL-3KIT, MDL-5KIT, and the MDL-7KIT. Each kit includes a retaining plate and two packers/gaskets. The packers are manufactured from ethylene propylene gaskets and are also available separately. If packers are supplied locally, they should be made from ethylene propylene rubber, PTFE with a hardness of approximately 50, or similar material. 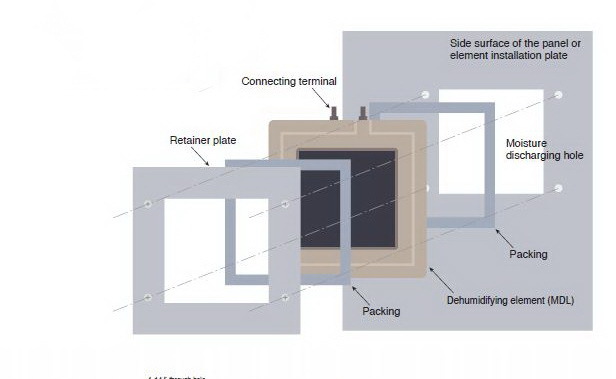 As shown in the figure, fit the packing to both sides of the dehumidifying element, attach the retainer plate on the top and fasten at around four points around the edge with M4 screws. Care should be taken to ensure the membrane terminals are adequately distanced or insulated from the panel surface. 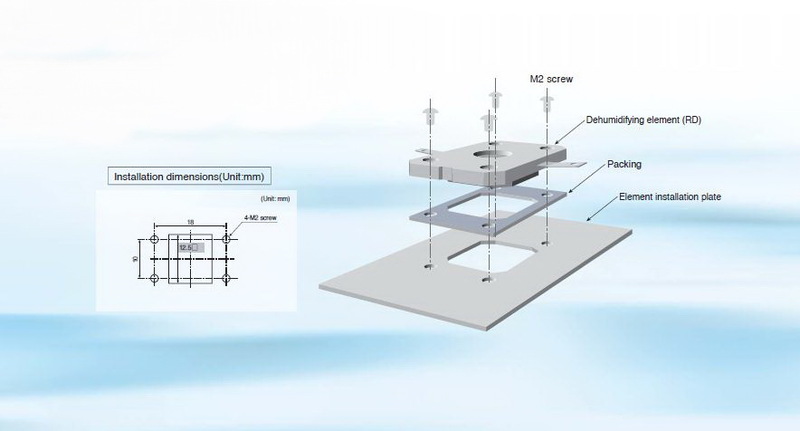 The M series use a simpler installation method than the MDL types. and a mounting kit is not required. It also offers a wider range of models. 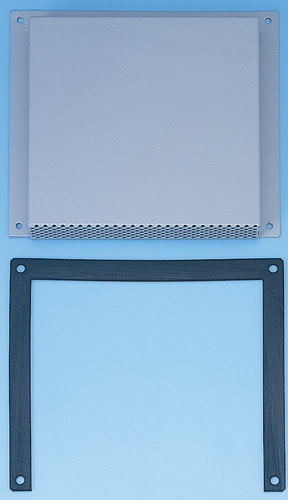 The membrane sits in a pre-drilled stainless steel mounting plate. It is also supplied with a pre-formed gasket. Generally, M-Series models installed inside the enclosure. To install the membrane, make a panel cut-out halfway up one of the enclosure side panels. The cutout should be the same size as the moisture discharging hole in the membrane mounting. Fix in position using fixing screws in the position indicated in the instructions. Using a protective cover (or rain cover) on the outside will avoid damage to the membrane. Where the membranes are installed outdoors, protection against the elements is necessary to prevent rain drops and insects from entering the moisture discharging outlet. Installers may wish to develop their own solution, or rain covers and adaptor sets are available from Westside International. The rain cover is generally used where the membrane is installed directly onto the side wall of the cabinet or enclosure. When installing in an outdoor panel, avoid interference between the mounting screws and the rain cover. 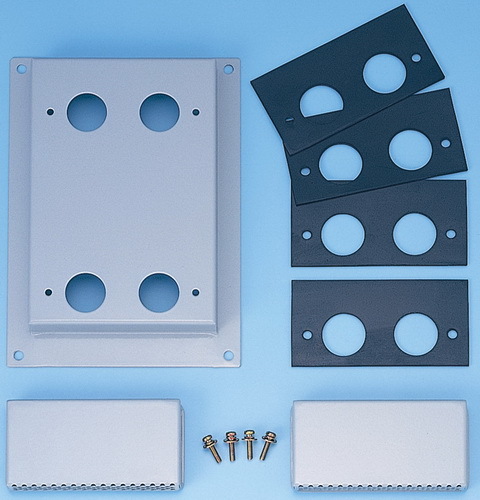 The adapter set is designed for retrofit installations where making square holes in existing cabinets is difficult. 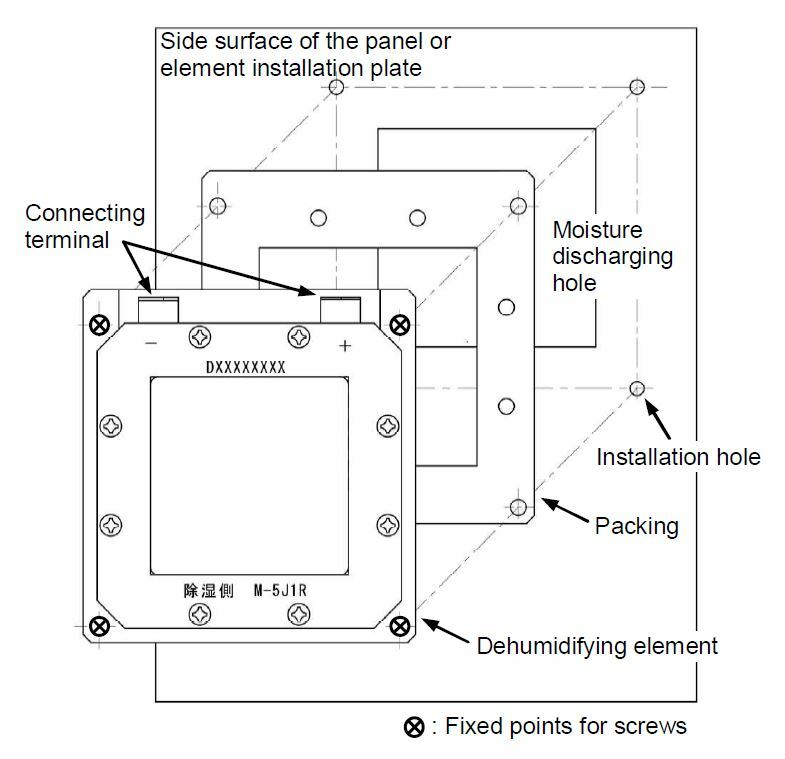 The product is suitable for round moisture discharging holes and prevents raindrops or insects from entering the holes when a dehumidifier is used in an existing outdoor panel. A special vent cover is included.